One of the most exciting and creative times in comics was when DC established in the Silver Age that there were two different, paralell earths upon which dwelled the superheroes of the Golden and Silver Ages, those being Earth-1 and Earth-2. And in this column, I’m going to write all about DC’s three (so far) collections of their classic crossovers between all these alternate worlds in the DCU, which took place at least once a year, usually in the late summertime, and were begun by the late, great Gardner Fox. One of the best things about this first part, which would be “Crisis on Earth-1!” and “Crisis on Earth-2!” is that, just when it seemed as if the heroes were able to best their foes, a clever backup plan of the villains was put to use, causing a setback for the heroes, and with that, more strategic thinking on the part of the heroes was needed in order to emerge from the previous predicament in order to get after their adversaries again. It all moves along at a very brisk, exciting pace, providing enjoyable action and suspense with every page. 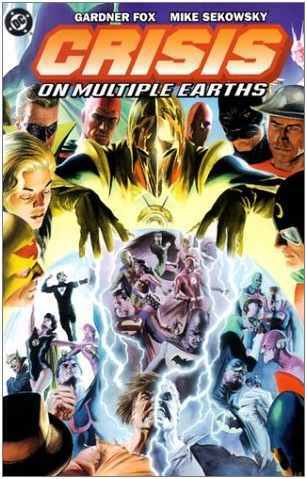 The next story is one in which the Crime Syndicate of Earth-3 made its first appearance, with the evil counterparts of many of the superheroes of the times being Ultraman, Superwoman, Johnny Quick, Power Ring, and Owlman. And with the latter, Batman’s own evil counterpart, in the picture, whose crimes are so brilliantly planned, things won’t go over as smoothly as the heroes might think. He recommends a special magical countereffect that’ll end up leading to the defeat of both the JLA and the JSA, when the latter comes in to deal with the Crime Syndicate in their turn. And to make matters even more difficult, Ultraman for one is not vulnerable to Kryptonite the way Superman is, and Power Ring’s you-know-what is not vulnerable to wood or yellow colors like Alan Scott and Hal Jordan’s is. Plus, Owlman, in contrast to Batman, has a superpower! This too is a very cool adventure, providing some more suspense and surprises for everyone’s pleasure. The third story is where Johnny Thunder meets up with an Earth-1 counterpart of his own who socks him unconscious and then takes command of his genie sidekick, Thunderbolt. This part is mainly a spotlight for the Justice Society, as they try to stop the evil Johnny of Earth-1 from committing crimes with Thunderbolt in tow, and gives them a chance to shine. It’s also got one of the funniest fight scenes involving the evil Johnny’s gang, whom he’s instructed T-bolt to transform into the roles of Superman, Flash, Atom, and Martian Manhunter. Simply thrilling. The fourth and last part here has the Justice League and Society dealing with a mysterious force that’s causing both the superheroes and various other people on both worlds to get transported from one plane to the other. And to make matters worse, Solomon Grundy is set free from a special prison where the Green Lanterns put him, ending up on Earth-1, while the pre-Crisis Blockbuster is broken out of his own jail, and goes on a rampage on Earth-2. But the really big climax here is when the heroes must all face off with a gigantic alien being referred to here as Anti-Matter Man, who’s threatening to destroy both earths with his anti-matter form, and the Spectre has to charge in first in order to try and stop him. One of the coolest things here was the appearance of the original Sandman, who’s got his own Sandmobile, and whose gas and sand guns have all sorts of neat gadgets included. And it was great to see even Wildcat in action here, as Ted Grant shows what a wonderful tough guy he can be. And it was such a joy seeing the Black Canary in the adventure too. Gardner Fox’s writing here is some of the best that he did during his tenure as a writer for DC during the Silver Age, and features plenty of excitement with every page. And the artwork by Mike Sekowsky was some of the best of the times. The sci-fi gimmicks here are some of the most appealing and engaging I’ve read. So if you’re looking for some really fun team-up adventures from the Silver Age with wonderful characters as the stars, this is where you’ll find them.